Find out how unabashedly extroverted New Zealand Sauvignon Blanc put the country on the wine map, and discover wineries and regions to explore. There’s something unmistakable and inherently likable about New Zealand Sauvignon Blanc. Its zingy acidity and heady aromas of grapefruit, pineapple and lime zest, freshly mowed grass and bell pepper can be hard to resist, and even harder to forget. For many a wine geek, Kiwi Sauvignon Blanc was their gateway wine. The style reeled them in and made them take notice of what was in their glass. New Zealand Sauvignon Blanc remains a predictable fridge staple, supremely enjoyable during hot summer days. So what is it about New Zealand Sauvignon Blanc that sets it apart from Old World brethren like Sancerre, Pouilly-Fumé or white Bordeaux? Why is it being emulated in wine regions around the globe? To answer those questions, you need to start at the beginning. 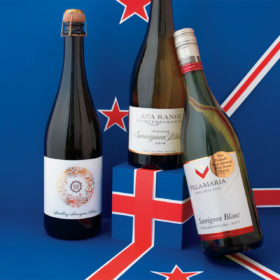 Although wine has been made in New Zealand since the 19th century, its modern wine industry wasn’t born until the 1970s. The first Sauvignon Blanc of note was made by Montana (now Brancott Estate). In 1973, the winery looked to expand beyond its Hawke’s Bay vineyards in the North Island by planting 2,900 acres of vines in the then-unheralded Marlborough region, on the northeast tip of the South Island. Montana recognized the potential of Marlborough’s climate: long, warm days and cool nights, acidity-enhancing maritime influence, minimum rainfall at harvest and free-draining soil. At the time, Sauvignon Blanc was still overshadowed by varieties like Müller-Thurgau and Chenin Blanc, Marlborough’s more commonly planted varieties. But then two major events in the mid-1980s altered the course of New Zealand’s winegrowing future. The first occurred when, due to a wine glut, the New Zealand government paid growers to rip up their vines. Many used the cash to uproot their less desirable varieties and replaced them with more profitable ones like Sauvignon Blanc. The second event was an outbreak of phylloxera. While this dealt a blow to the industry, it gave growers another opportunity to replace their old varieties with the likes of Sauvignon Blanc and Chardonnay, this time on phylloxera-tolerant rootstock. Arguably, no brand has played a greater role in the success of New Zealand Sauvignon Blanc than Cloudy Bay. Established in 1985 by David Hohnen, founder of Cape Mentelle in Australia’s Margaret River region, Cloudy Bay was the first to produce premium Sauvignon Blanc in the distinctive New Zealand style we know today. The brand’s global reach helped put Marlborough, and to some extent all of New Zealand wine, on the map. In 2003, Cloudy Bay was bought by multinational luxury brand group LVHM. Despite founding winemaker Kevin Judd leaving in 2009 and production increasing dramatically in recent years, the name is still synonymous with both Sauvignon Blanc and New Zealand wine. The Marlborough region also looks very different today than it did in the 1980s. A flight into the region’s main town of Blenheim reveals how wine has reshaped this part of the world. Bird’s-eye views of the long, straight Wairau Valley, where the majority of grapes are planted, reveal mile upon mile of flatlands blanketed in neat rows of grapevines. There’s very little land left to develop in either of the region’s two main valleys, the Wairau and the Awatere. Amidst a sea of wine labels, large-scale producers like Villa Maria, Kim Crawford, Giesen, Saint Clair and Nautilus produce solid, wallet-friendly examples of Marlborough Sauvignon Blanc. Smaller-scale producers, including Jules Taylor, Huia, Loveblock, Zephyr, Greywacke and Seresin make classically styled, yet often complex, site-expressive wines. There’s life beyond Marlborough, however. Sauvignon Blanc is produced in the majority of New Zealand’s wine growing regions. Just 70 miles west of Marlborough at the northern tip of the South Island, lies the region of Nelson. It produces Sauvignon Blanc that’s crisp and herbaceous, but often with a little more fleshy fruit and complexity, thanks to its sheltered seaside location and abundant sunshine. Seifried and Neudorf are two longstanding producers to try. Across the Cook Strait at the bottom of the North Island, Sauvignon Blanc from the Wairarapa region often expresses itself with chalky minerality, prickly acidity and fragrant stone fruit characters. Ata Rangi, Craggy Range, Schubert, Martinborough Vineyards, Palliser and Urlar all produce excellent examples. In Hawke’s Bay, on the eastern edges of the North Island, the warmer, milder growing conditions are often likened to being somewhere between Burgundy and Bordeaux. The stony soils of the famed Gimblett Gravels district in Hawke’s Bay produce highly mineral and long-lived Bordeaux blends. There, Sauvignon Blanc is unsurprisingly riper and richer than in Marlborough, with fruit characters sitting firmly in the tropical spectrum. Producers in these parts often like to ferment and/or age portions of their Sauvignon Blanc in oak to add texture and complexity. Great examples can be found via Te Mata and Trinity Hill. The regions of Central Otago, Canterbury, Gisborne, Auckland, and Waikato-The Bay of Plenty also produce their own versions of the grape, although less of these wines make it to our shores. Wherever it’s from, you can’t deny the hold that New Zealand Sauvignon Blanc has on the world. Decades after it exploded onto the scene, the unabashedly extroverted white wine is going stronger than ever. Even amid the fickle and fast-paced times we live in, New Zealand Sauvignon Blanc is here to stay. Now that you’ve got the history, explore New Zealand Sauvignon Blanc outside the box. Boundary-pushing producers are changing the face of New Zealand’s most famous white wine.